King Rama I is arguably modern Thailand’s most important historical figure owing to the fact that it was he who founded the Chakri dynasty of which the current Thai king is the ninth. Browse places to stay in Amphawa on Booking.com. Book Now - Pay Only When You Stay. Rama I’s queen, Khun Nak, was a native of Amphawa. Their son, who would later become Rama II, was born here, and the young family dwelled in the area now occupied by the park decades before Rama I ascended the throne. After becoming king in the late 1700s, Rama I is thought to have sanctioned the building of Wat Amphawa Chetiyaram, which is home to a large sitting Buddha surrounded on all sides by stunning reliefs depicting scenes of the early Rattanakosin period, including one that shows the crowning of Rama I as king in his brand new Bangkok capital. 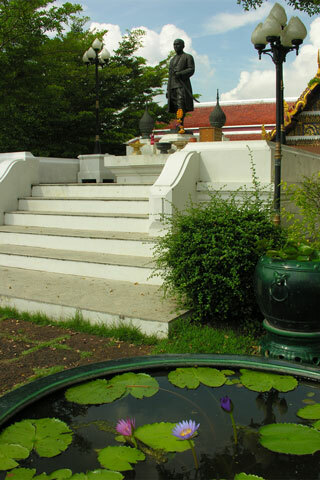 A statue of Rama II was erected in a small park beside the temple in the 20th century, and the nearby riverside area with its spacious market is worth a stroll. Admission is free.